What Predator Eats the Key Deer? Key deer are the smallest type of white-tailed deer; they do not interbreed with any other species of deer. They are found exclusively in the Florida Keys, specifically Big Pine Key. The key deer was declared an endangered species in 1967, and the population continues to decline, mostly due to human intervention into their habitat. The key deer's population is in severe decline, but the dropping numbers are not because of natural predators who are hunting the key deer. In a truly wild environment, the key deer's natural predators would be Florida panthers. Panthers also are endangered and are not commonly seen in the keys. A more relevant concern for modern key deer is the python, an invasive snake species that has become a problem in south Florida. The large pythons are capable of hunting and consuming a wide variety of animals, including deer. Environmental experts and officials are concerned that the already endangered key deer population may continue to face a serious threat from the python. Most key deer die as the result of human actions. Over-hunting by humans was one reason that the key deer population initially went into decline. Hunting key deer was outlawed in 1939, but humans still pose a significant threat to the key deer population. Collisions with vehicles account for the majority of key deer deaths every year. Humans also illegally feed the key deer -- usually food that's not healthy -- which encourages them to approach populated areas and puts them at risk for dangerous encounters with cars, pet dogs and other human-created hazards. Dogs, both domestic and feral, pose a threat to the key deer and may chase or even kill the deer. 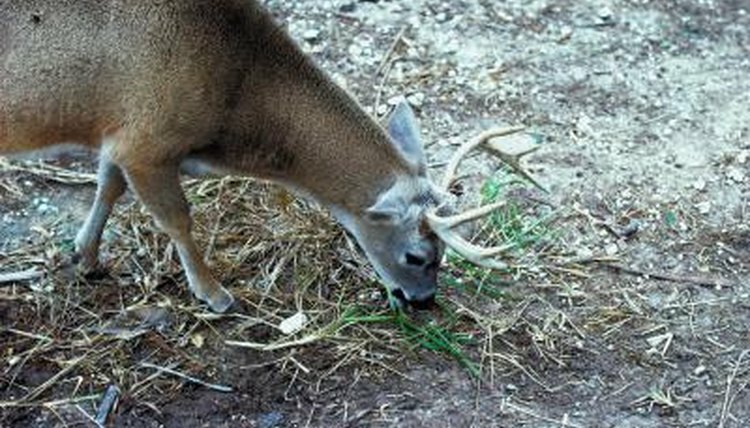 Loss of habitat is a significant problem for the key deer. The diet of the key deer consists of vegetation that is found in the Florida keys. Invasive species of iguanas have become very common in the keys and compete with the key deer for food, eating many of the same plants that the key deer eat. Habitats are also being destroyed by the continued residential and commercial development of the Keys. Key deer are vulnerable to hurricanes and flooding. Key deer can swim, but many have been found drowned in drainage ditches that were dug on the Keys to prevent housing and commercial areas from flooding. Illnesses from disease and parasites can also pose a threat to the key deer population. Melanie In Miami: Hunters -- The 2013 Python Challenge is Here! What Kind of Deer Are in Pennsylvania?